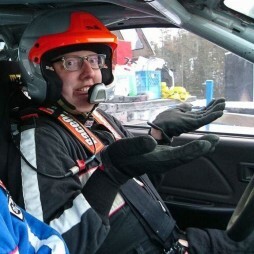 Kenneth and Peter have been competing together since 2012, and make up half of the Mullen Rallysport team, completed by Ken's brother Curtis, and Trent Leblanc co-driving. For the last 4 years, the weapon of choice was another red '91 golf, running a regular 8v motor, which ran in P2wd class. That car was quite successful, and even netted us a P2wd Championship in the Rallywest series in 2013. Now armed with a duo of red rallycars, an O2wd class 1.8T powered MK2 VW Golf with a Kalmar Dogbox, and the newest addition, a P4wd class 2004 Subaru WRX, the team looks to gain experience in both disciplines. Many thanks to all the organisers, volunteers, media, and fans, who support our sport and make everything possible! !